Time In The ICU Means Worse Outcomes For Pregnant Moms With Severe Flu : Shots - Health News Pregnant women in intensive care with severe cases of the flu have a higher risk of giving birth to babies prematurely. The risk of breathing problems for the baby is also substantially higher. The study also found that babies of the most seriously ill women were eight times more likely to have low Apgar scores, a measure of a baby's health in the minutes after birth. The test assesses the baby's color, heart rate, reflexes, muscle tone and breathing. 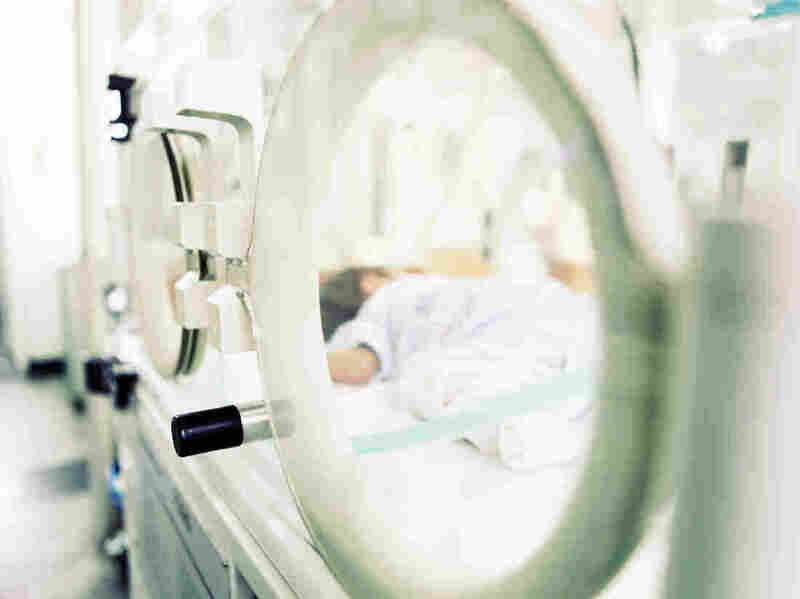 It's not clear exactly how being in the ICU may have affected the newborns, says Dr. Sonja Rasmussen of the University of Florida College of Medicine, one of the study's authors. She doesn't think the virus itself causes the problems, but concedes there's not enough information to draw firm conclusions. More likely, Rasmussen believes, the problems arise because pregnant women with the flu are at "greater risk of getting pneumonia, of needing to be hospitalized and even being admitted to an intensive care unit," she says. "When moms are in the ICU, they often need help breathing, they need a ventilator to breath for them, and it may be that there is some period of time where they aren't breathing well enough to get adequate oxygen to the baby," says Rasmussen. Rasmussen says it's possible that nutrition plays a role in the newborns' problems. "When you're having trouble breathing, you have trouble eating and it may be that mom wasn't getting good nutrition during her time in the ICU." "Since then, flu vaccine rates have stagnated" as memories of the pandemic have faded, says obstetrician-gynecologist Dr. Denise Jamieson of Emory University School of Medicine. The "vast majority" of pregnant women should be vaccinated, she says. Jamieson says the reasons patients give for not getting the vaccine are numerous. Some say they've just never had the flu before and don't expect to get it while pregnant, which "doesn't mean they'll avoid the flu this season," she says. Others say they got the vaccine in the past and it made them sick. That's unlikely, Jamieson says. The flu vaccine does not contain active virus, but rather is a "killed" virus vaccine, and therefore not infectious. Still other patients worry the vaccine might not be safe for their developing baby. That's another fallacy, Jamieson says. "This is a vaccine we have been giving in pregnancy for many decades and there is no indication of any problems," she says. "It's a safe vaccine and we know more about this vaccine than any other vaccine in pregnancy." And, importantly, it has huge benefits which include "safeguarding pregnant women and their infants against what could be devastating complications of influenza," she says. When women get vaccinated, they make antibodies to fight the virus. Those antibodies can cross the placenta and protect the baby from severe illness, which is important, Jamieson says, because infants' immune systems are still developing and they can't be vaccinated until they are 6-months-old. So the vaccine "provides some protection from birth up to six months of age," she says. And it's never too late or too early to get the vaccine, according to Jamieson. Pregnant women should get their flu vaccine as "soon as it's available," she says.